I ponder the Photo Challenge of the Week: Hands. 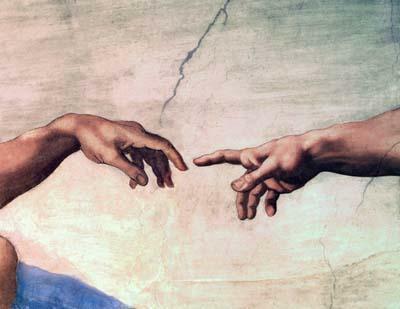 I keep coming back to the famous art work by Michelangelo’s “Hands of God And Adam”. Adam literally means “earth” in Hebrew, what God called His first man. This Hebrew word is derived from a word which means “to be red”, ruddy color like man’s skin or the Akkadian word “adamu” meaning “to make”. According to Genesis, Adam was made from the earth “adamah”. With gardening, I feel the presence of God in all my senses. I touch the dirt, the living earth. I smell the basil as I plant it in the terra cotta pot, and hear the raindrops fall on its leaves. My eyes and heart see the delicate pink hibuscus blossom opened wide to the sunlight peaking above the green tree tops. And I taste the goodness of God when I indulge in my salad greens. God is good!